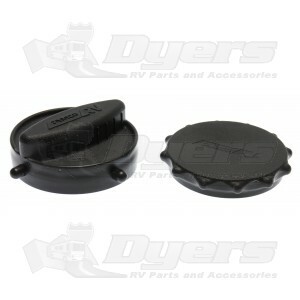 These versatile caps work with Easy Slip, Rhino FLEX and Revolution sewer hose fittings. Set of two; one each for bayonet and elbow fittings. Can be used with Revolution, Easy Slip and RhinoFLEX fittings. good product, excellent quality & price. I had lost the end cover one day as I proceeded to hookup my sewer hose. I had unfastened it and then it slipped out of my hand and bounced twice and disappeared down the drain hole before I could grab it. Thankfully I was able to order another on line as the stores didn't have any.